On April 10th, we got chicks. That means that they are just over a month old, now. About a week ago, we discovered how much they like worms. We were weeding the garden and started coming across worms. We thought we would give them one. 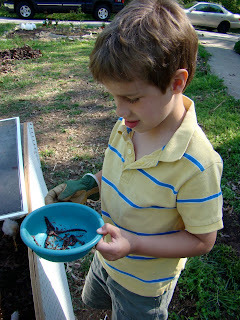 They went so crazy that I decided to save the worms I found. This is what happened. We are now best forever friends. How fun! Enjoy your chicks! And, I wanted to let you know that I got my Life of Fred book that I won on your other blog. We haven't started using it yet (maybe this summer), but I've read a few chapters and love it! I'm looking forward to using it. Thanks again!!! I'm glad you got it. My boys love them!